Moorabbin is a residential and industrial suburb 16 km south-east of Melbourne on the Nepean Highway about 3 km from the coast of Port Phillip Bay. It was also a municipality between 1871 and 1994. The name is thought to have derived from an Aboriginal word meaning mother's milk, as Moorabbin was reputedly a place where mothers and children stayed while male tribesmen went further afield. Certainly there was a series of springs or soaks through the area, notably at Cheltenham. In the 1850s the pastoral runs in Moorabbin were subdivided for increased settlement, but the district relied on the Brighton township and smaller villages at Sandringham and Cheltenham. 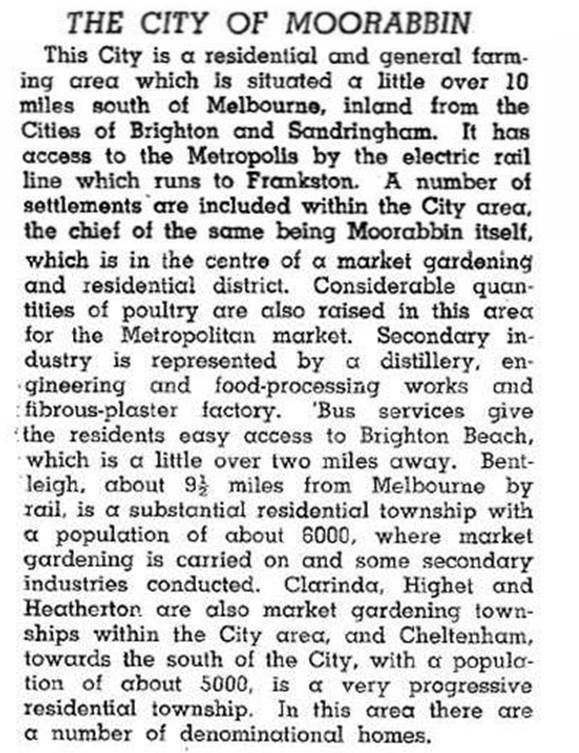 Moorabbin grew as a farming and market garden area. In 1854 the Wesleyan church opened a primary school which continued until 1872, when it was replaced by a State primary school. In 1862 the Moorabbin district, which included Sandringham, Mentone and Mordialloc, was made a Road Board District and on 27 January 1871, it was made a shire. When the railway extension from Caulfield to Frankston was opened in 1881 a station was provided at Moorabbin, but most excursionists made for Mentone and Mordialloc where there were seaside amusements, fishing and game-shooting. Moorabbin's small township had the Plough and Harrow Hotel as its main building, and was known as South Brighton until 1909. In 1917 Sandringham borough was formed by severance from Moorabbin shire and in 1920 Mentone and Mordialloc shire was severed. In the remaining Moorabbin shire the Moorabbin township (1770 persons), was much smaller than Bentleigh (7700) and Cheltenham (4100) in 1933. The shire, nevertheless, grew in population during the 1930s, and on 10 October 1934, it was proclaimed a city. Land was also suitable for the location of factories, the flat sandy soil providing large and stable sites. The Moorabbin district's flat ground was good for airfields and the first Aerial Derby was held at the Epsom racecourse, Mordialloc, in 1920. In December 1949, metropolitan Melbourne gained a second general airport when one inland from Mentone and Mordialloc was opened. It is now the Moorabbin (Harry Hawker) Airport, and during the 1960s was the busiest in Australia with high numbers of small and medium planes. Between 1947 and 1954 Moorabbin city's population more than doubled to 65,000 persons. In another 12 years it exceeded 100,000. The Council opened a new town hall and offices in 1963 on the Nepean Highway near South Road. The St Kilda League Football team moved its home ground from an area of declining population to the growing south-eastern area at Moorabbin in 1965. The area between Bentleigh and Moorabbin was filled with residential subdivisions and the Victorian Railways opened the Patterson station in 1960. During the 1950s-70s Moorabbin city was metropolitan Melbourne's burgeoning ‘sand belt’ residential area. Until the 1990s the suburb of Moorabbin extended (west to east) from Bluff Road to Warrigal Road, bounded on the north by South Road and on the south by Wickham and Keys Roads. The part between Bluff Road and Nepean Highway, Moorabbin West, was a State Housing Commission estate of about 950 dwellings, built in the 1950s. Given the area’s proximity to Hampton the name was formally changed from Moorabbin West to Hampton East in 2000. The Moorabbin West primary school (1950) closed in 1992 and a Gilbey’s gin distillery (1937) on Nepean Highway closed in c1987. The suburb is now Hampton East. Moorabbin East, between Chesterville and Warrigal Roads, is mainly industrial. It was noted for food and beverage industries such as Schweppes, Coca Cola Bottlers, Philip Morris (closed 2014), along with manufacturers and warehouses. Residential Moorabbin, from the railway line to Chesterville Road, has the area’s first State primary school (1872), the former St Kilda football ground, Southmoor primary school (1963), a TAFE (originally Moorabbin technical school) (1954), a Catholic primary school (1957) and shops near the railway station. The former council offices are an arts centre. There is a small strip shopping centre at the Patterson railway station. The St Kilda football club moved their home ground from Moorabbin Oval (1965-92) to Waverley Park in Mulgrave (1993-2000) and then to Docklands Stadium (2000-) and their training ground from Moorabbin to Seaford in 2010. When local government boundaries were changed in 1994 about half of Moorabbin city was united with Kingston city, about a quarter with Glen Eira city and the remainder with Bayside city.